Vilnius, my former home and one of my favorite cities, is exploding with cool new openings and updated old favorites. During my recent visit in late-April to early-May, I got tips from friends and Instagram to check out the cool new/updated markets that have popped up around the city. 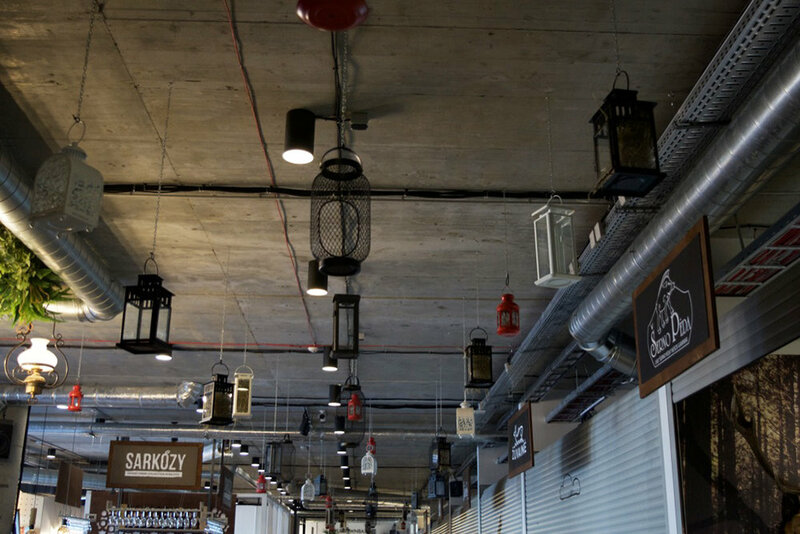 Now, you know I love a good market--and delicious food options--so it was a pleasure to find that Vilnius had opened and renovated some indoor foodie venues. Let's start with an oldie that's getting an interior facelift: Hales Market. This former train station built in 1906 was renovated into a market in 2006. It features a large area of indoor space and a bit of outdoor space, in which vendors sell meats, cheeses, produce, and more. Recently, however, Hales Market has seen an influx of cafes, bakeries, and restaurants including Assorti (an import/local specialty grocer), Eastanbul (a Middle Eastern specialty grocer), and Wings (a coming-soon chicken wing restaurant). But don't worry that gentrification has ruined Hales Market, as you can still find great deals on in-season fresh fruit and vegetables. Note that Hales Market is closed on Mondays and the rest of the week is only open from the morning until the early afternoon. Find out more on their website and Facebook page. With the awesome street art, pop-up designer markets, and new construction, the Stotis neighborhood is enjoying much needed gentrification that hasn't yet drastically impacted apartment prices or overall cost of living. The newest addition to this awesome up-and-coming area (that is great for flight attendants and pilots on account of it being close to the bus/train stations) is the Uptown Bazaar, an eatery and indoor specialty food shopping center. Inside Uptown Bazaar, you'll find restaurant stands selling made to order foods such as burgers, coffee, salads, hot dogs, and pizza. The spots that were recommended to me were the taco spot and the Thai rolled ice cream stall. Both were closed when I visited in early afternoon on a holiday, so I can't personally recommend them. J and I ate at the burger spot, and in my opinion, the sandwiches were just average. The Uptown Bazaar is an awesome option if you're looking for a place to dine out with kids since there are so many different food options and there is a small indoor play area. This definitely made our meal super enjoyable. You can find Uptown Bazaar near the hook building on Kauno g. 16. Read more about their opening hours on their webpage. Though I didn't have time to visit Benedikto Turgus on my recent re-visit to Vilnius, it did catch my eye on Instagram and had I had a bit more time, I would have made the trek out to it. In photos at least, Benedikto Turgus reminds me a lot of Torvehallerne in Copenhagen, with trending foods available at the restaurant stalls, ample seating space, and a section to purchase fresh, local produce and specialty food items. Benedikto Turgus is located outside of Vilnius' city center on 259A, Ukmergės g. To reach the market, you'd need to take a bus, taxi, or drive. Find out more about the market on their webpage. There are also several vegetable markets in Vilnius for everyday shopping. My favorites are Kalvariu Market (great prices, tons of selection) and Tymo Turgus (organic produce, every Thursday). If you're looking for a great hotel for your stay in Vilnius, my favorites are Shakespeare Boutique Hotel* and Artagonist Art Hotel.